As the Perses escapes from the terror of the wrecked Prometheus, an invisible stowaway forces the crew into a deadly conflict! While the crew defend themselves against this unseen predator, the hunter itself stalks a much more substantial game! 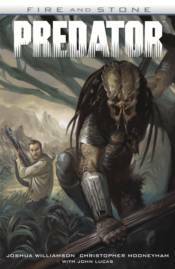 Collects Predator: Fire and Stone #1-#4!